Follow the following stretches to help relieve tension caused by stress. Sitting tall, slightly tuck chin down into neck. Elongate neck by visualising a string pulling back of head up to celining as you use fingertips to gently guide motion. Sitting tall, grasp back edge of the chair with hand of the side to be stretched. Turn head to opposite side and flex head forward (nose toward elbow). Let body lean to feel a stretch in the back and side of the lower neck. 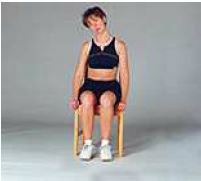 Seated, turn head to one side and tip ear to the opposite shoulder. Rest hand on side of head, do not pull on head. With opposite hand, slowly alternate shrugging with reaching for the floor. Sitting tall, keep shoulders back and down. Bend head slightly forward then top ear sidewats toward the shoulder to feel a stretch in the side of the neck. Sitting tall, turn head 45 degrees to one side. Keeping head turned, lift chin up to the sky as if to be star gazing to feel a stretch in the front and side of neck. Sitting tall with shoulders relaxed down and back. Tip head straight sideways, ear to shoulder, as far as comfortable. Sitting at edge of chair, feet and knees wider than pelvic width and rotated slightly outward. Maintaining a chin tuck, raise chest up, allowing spine to relax into a gentle arch. Relax shoulders and rotate arms/hands so that thumbs point backward. Hold, brathe, release and repeat throughout the day. Sitting with legs apart, hands by head resting on wall. Let mid back sag through shoulder blades towards wall. Stand at a 45 degree angle facing a closed door with one foot in front of the other in a lunge type position. Reach forward and grasp doorknob then slowly sit lower body down and backward to feel a stretch in the back and side of the shoulder. Sitting or standing with hands open, palms together in front of stomach. Begin with arms below shoulder level. Inhale. Exhale and actively bring arms straight back as far as possible keeping tall posture. Hold briefly at stretch position and return to start position. Repeat motion raising level of arms each time until arms are up in a “Y” position. Repeat the process back down to the start position. Holding a towel or stick in one hand, reach that hand behind the head and place it down the back. With the opposite hand behind the lowe back, grasp other end of towel and try to walk hands together. Hold where comfortable and breathe. Standing, raise one arm up to shoulder level and grasp a door jam or banister. Keeping arm horizontal to the floor lean body weights striaght back. Keep shoulder blade square and do not allow upper body to rotate. Standing or sitting, reach one arm up overhead and grasp with opposite hand. Actively reach hand toward the ceiling while bending slightly to the side, assisting with the opposite hand. Breathe in while reaching, breathe out while releasing. Lying on stomach, place one arm over the other. Lie upper body weight down to stretch the shoulder of the bottom arm. Breathe, relax then raise up to perform stretch with the opposite arm underneath. Lie on back with knees bent and feet flat on the floor. Place a rolled up hand towel along spine between the shoulder blades. Stretch arms out to the sides and relax as spine gently extends over towel.